I love food, simple as that. Coming from a family of cooks; one of which is a world renowned chef that has penned several cookbooks and is currently working with one of the recent Top Chef winners. A sister who always experimented with food; she would create a huge tower of croquembouche, a french delicacy in the form of a tower of golden ball pastries stuffed with vanilla cream and spun sugar drizzled around as if it was art. I grew up in that environment and learned to appreciate the art of cooking. So it was no surprise that I jumped at the opportunity to join a walking food tour of the East End of London with Eating London. The tour would start in Old Spitalfields market in the East End. A group gathered by the quaint seating area behind the cafe inside the market, I saw some old familiar faces and met some new ones. Emily, our tour guide walked up to me and signed “Good Morning” in American Sign Language. I was so surprised and touched that once she found out that I was Deaf, she took the time to look up how to say Good Morning in my language. I’ve never had a tour guide do that before, which made the experience much more special. Our first stop was St. John Bread & Wine, a place known for their Snout to Tail philosophy. Once upon a time it would be a commonplace to use every piece of the meat, the liver, heart, everything would be used since food would be scarce. Somewhere along the way, it fell off the map but recently there has been a revival of sorts with the method. Once you first walk in, you are hit with this heavenly smell of pork roasting, you know its been marinating for days- ready for you to devour. Our dish was the infamous bacon sandwich, with a special homemade ketchup with several secret ingredients, one of which is a fruit(not just tomatoes- nice try…) I dare you to go try and taste it and then guess which fruit was used. I won’t give away the secret. We made our way to The English Restaurant where the group dined on the most scrumptious bread pudding I have ever had in my life. If you want to experience the quintessential English bread pudding, I highly recommend you stop here. Just take a moment and just take in the bread pudding in all its glory, and then scarf it down in one bite. It is that good. With a sweet cinnamon flavor, with cubed bread in the middle of the dish that has a spongy cake like texture to it and a creamy sauce oozing out of the bread pudding… The trick is cut into the middle of the cake to get the sauce. The English Restaurant, a 17th century heritage location is truly a throwback to the past with a cozy feel to the establishment. What I personally loved was hearing about how wedding receptions are held here, and instead of a cake- they create a large bread pudding for the wedding party. I absolutely adored the idea, what a unique approach to a wedding party that steered away from a traditional expensive wedding cake. What a perfect place to break bread with your family and friends. The tale of the cheesemongers begins with two brothers hailed from France. They started Androuet cheese shop in both London and Paris in 1909. Their passion for cheese is clearly evident. Cheese was stacked up on the shelves, with little tags that gave away their names. 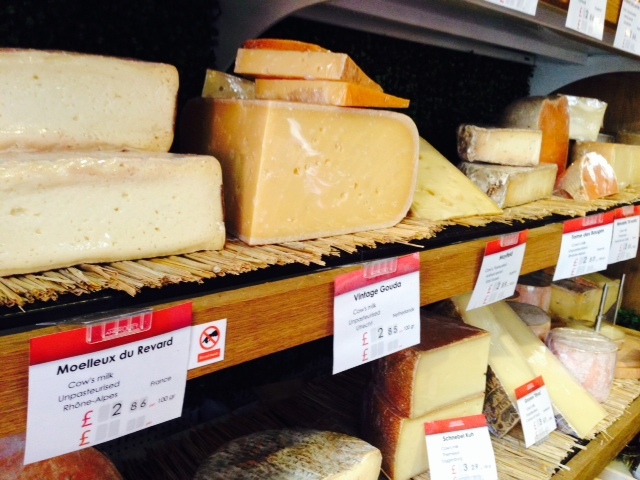 They store hundreds of cheese, from Stilton, Camembert, Gruyere, and to lesser known ones called the Stinking Bishop. I asked the cheesemonger about the Stinking Bishop cheese, and he mentioned that it was actually their least favorite cheese they have in the store. If they unwrap the cheese a horrible stench unleashes through out the store. Clearly, the cheese lives up to its reputation. All of these cheese in one place was heaven for me seeing that I absolutely love cheese- brie, camembert, goat cheese are just a few of my favorites. I could have stayed all day and tasted each flavor of each cheese, from the tart ones, the sweet or even the stinkier cheeses. Perhaps accompanied with a glass of wine- non? Many cities are known for a special dish; London has many dishes it is known for- but none more so than Fish & Chips. One of the staples of the East End is Poppies- it has been around since 1945. 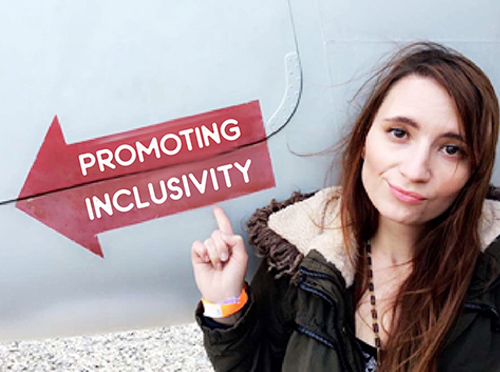 Poppies is also known for their rebellious stand against the banning of wrapping battered fish in newspaper. Well, Poppies worked around that, they saved a bunch of newspaper and took it to be specially printed onto napkins. So a clever way of keeping tradition alive- you can still see the specially made napkins wrapped around their famous fish& chips. 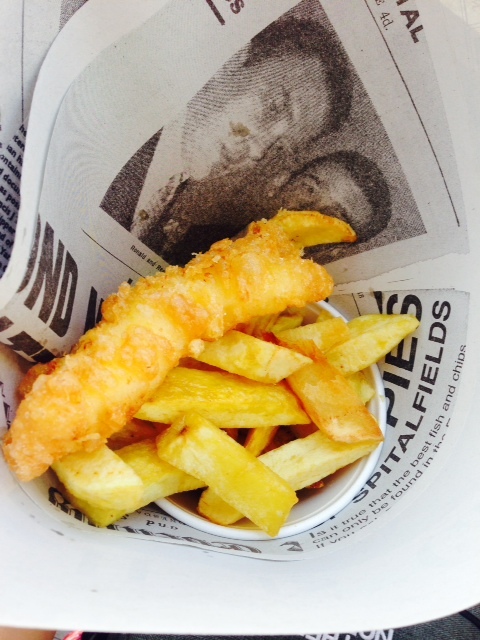 As for the dish itself, a crispy battered fish in a golden color, cocooned in a coned shaped “newspaper” with thick cut chips, perfect for take out. I delighted in the quirkiness of Poppies, the establishment was a retro throw back to the 50’s. A reminder of the past in a quickly evolving, modern city. Here is a tidbit of history: shucked oyster shells would be scattered on the ground outside of the building in the years leading up into the Victorian times; this particular area of the location was where the poor lived and oyster was consider cheap at the time. 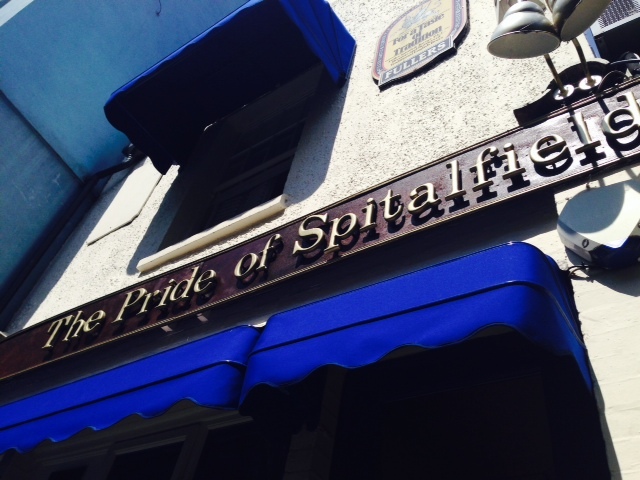 Pride of Spitalfields- When you picture a traditional english pub, this would be the place. Tucked away in a sleepy corner is a pub full of english charms. Little wooden rickety tables with red velvet stools littered throughout the pub and a tufted wraparound red velvet bench underneath the window. A tiny brick fireplace on the side for those rainy days, red and green floral carpet throughout the pub with a dark wood pub counter with glass hanging overhead. Old black and white photos embellished on the walls of the pub. We sampled their beer, and a somerset cider. If you’re looking for a classic pub with all of the old-timey charm; this would be the place to visit. If you’re lucky, you might spot the pub’s elusive cat that surreptitiously wanders throughout the pub. When you walk down Brick Lane, you will be ambushed with several waiters shouting, and claiming it is the “Best Bangladeshi restaurant in all of Brick Lane” While a lot of them boast a “Tripadvisor rated” or “Time out best Bangladeshi restaurant” sign in their windows. On my first night in Shoreditch, my friends and I made that very mistake and followed one of them to nearby restaurant and discovered that the food was dismal and the service wasn’t great. It wasn’t until this tour that I finally discovered a fantastic Bangladeshi restaurant. Aladin on the world famous Brick Lane street, is the real deal. I was met with great servers who was helpful and presented with fantastic sample of Bangladeshi food. 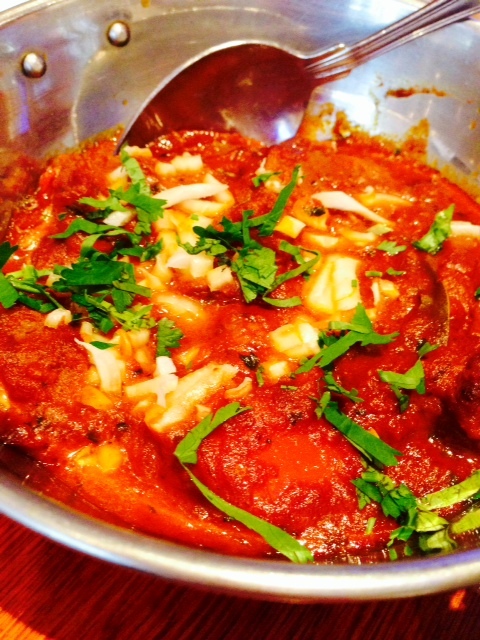 Bangladeshi cuisine differs from Indian food, because they use beef, since beef is taboo in Hinduism religion. Bagel bites: Craving bagels and salt beef in the middle of the night? Well, Beigel Bake is your best bet, since they are open 24 hours. 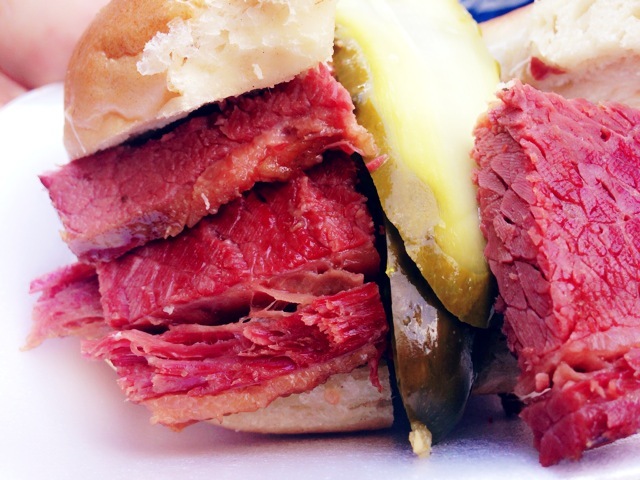 Sandwiched between the bagels are stacks of salted beef, with a side of pickles. Beigel Bake is another world famous establishment that catered to the masses for fifty years. There was a time in Brick lanes history, where the area was populated by Jewish families. 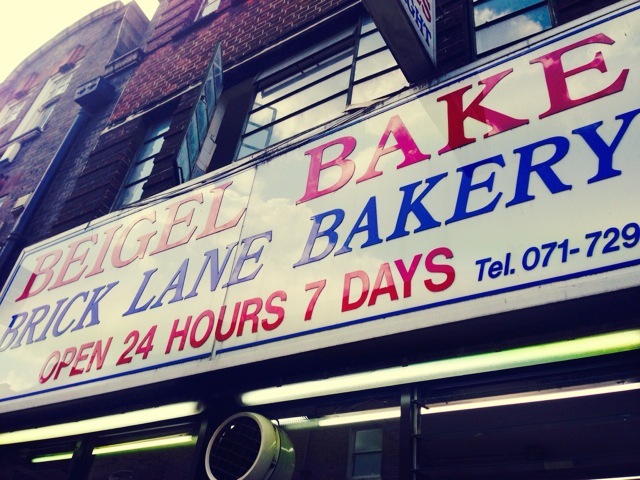 Throughout the years, while the communities have changed- one thing remained the same, the East Ends love for Beigel Bake. Salt Beef sandwiched between bagels. Pizza East, our final stop of the three hour tour. A snazzy, upscale place with an industrial vibe. Growing up with a mother who is an interior designer, I couldn’t help but think that my mother would appreciate how they furnished the place. A long wooden bench with a iron bench attached that swung out to sit down, it looked as if it was something attached to a railroad car. Dark wooden floors and low hanging weaved lanterns hung from the ceiling- this former tea warehouse was recently in Time Out London. 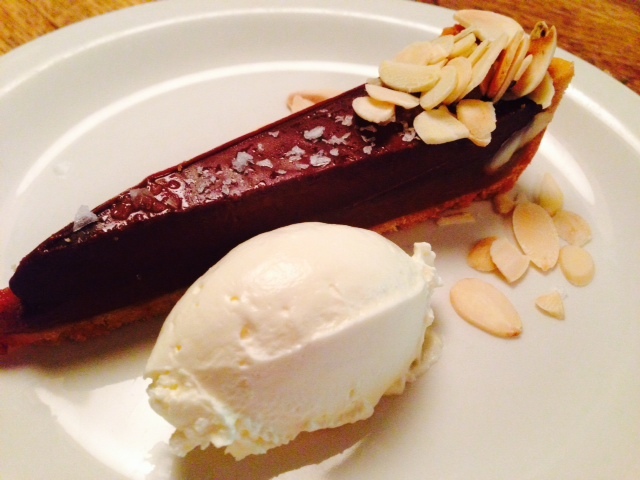 But not for a reason you may think, they are actually known for their dark chocolate salted caramel tart. Dark, rich chocolate tart layered with caramel and a hint of salt sprinkled on top with a side of vanilla ice cream was a visual delight. If you are a chocolate lover like I am, I guarantee you this is a stop not to be missed. If chocolate is not your forte, then try the scrumptious passionfruit gelato. Pizza East also serves wood burning pizza, and other italian dishes. With a belly full, and a newfound appreciation for English food. A country that was once touted with the title of terrible cuisine, let it be known that it is not the case anymore. London is forging ahead with multiples of restaurants dedicated to changing the image of English dishes. As for the price of £65, it is quite steep. But honestly I’ve found that it is well worth the price, to eat more than a few full meals, a tour of the East End, discover art, and work off what you’ve eaten. You may spot several Banksy or Roa graffiti art on the walls of buildings that Shoreditch is famous for. The tour also appeals to history buffs as you learn about the different cultures that used to inhabit the East End, Jack the Ripper, the true meaning of daylight robbery, the dark history behind Artillery lane, and you might spot a facade used for films. 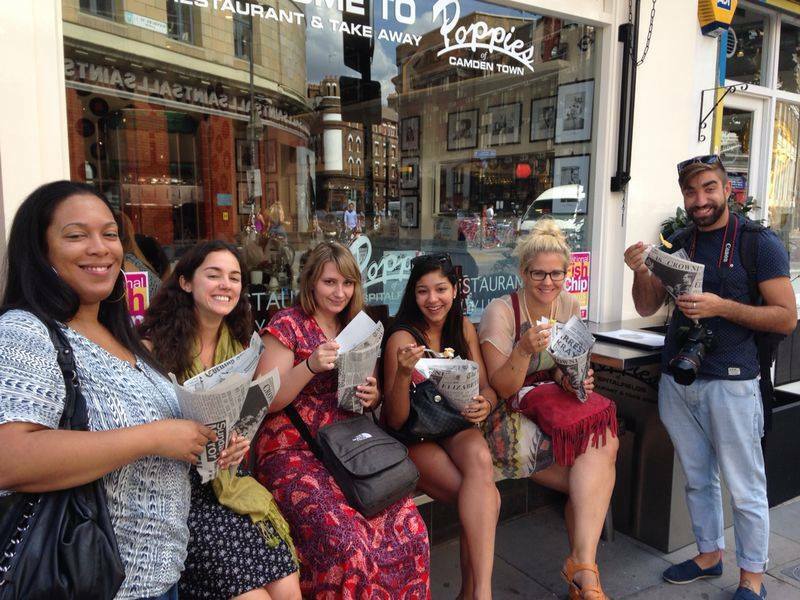 Electric vibe with an artsy soul that is the East End, grab a fork and join the tour. Note: Be there fifteen minutes early- do not be late! Wear a skirt or pants with buttons, as you will need to unbutton a few buttons at the end of the day 😉 Also bring some good walking shoes as it is a three hour tour. 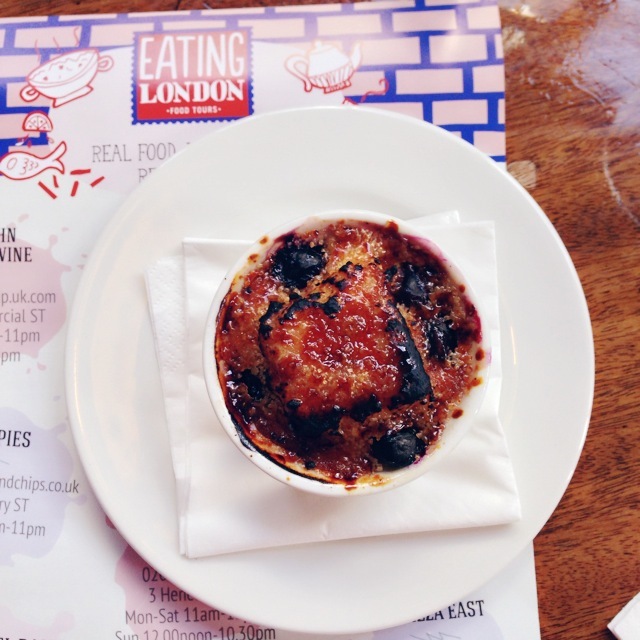 Disclaimer: I was invited to participate in the Eating London food tour, but all photos and opinions are my own. Huge thanks to Eating London for being very accommodating and for allowing me to sample some of the East End finest dishes. St. Bee’s Island… is it a real place?? 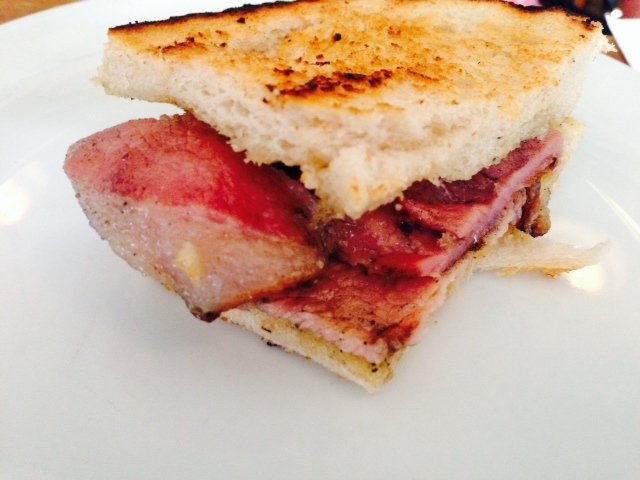 Great piece following a great experience with the diverse tastes of London. Would’ve been nice if you had sampled some African-Caribbean delicacies in restaurants across London notably South East and North East of London. Thanks for the great story you have told.